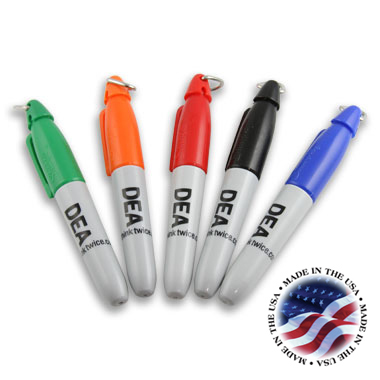 These great selling Mini Sharpie markers have the DEA Badge and text imprint. In assorted colors, these markers have a portable fine tip marker in half the size or a regular marker. Take it anywhere for tasks on the go. Cap clip easily attaches to key chains, golf bags, lanyards and more. Permanent on most surfaces these markers are quick drying and have an AP Certified nontoxic ink formula. If ordering 1 marker, please specify color. All multiple orders will be fulfilled in assorted colors.